Ht / Wt: 6'2" / 221 lb. 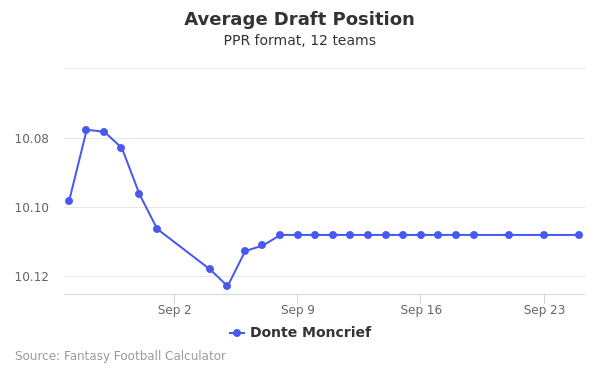 Donte Moncrief's fantasy value is measured by his average draft position (ADP) in fantasy football mock drafts. 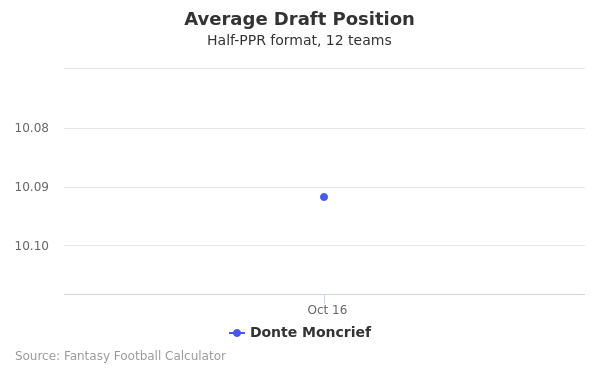 In recent drafts, Moncrief's current ADP is 13.07, which indicates that his fantasy outlook is to be the 7th pick of the 13th round, and 150th selection overall. 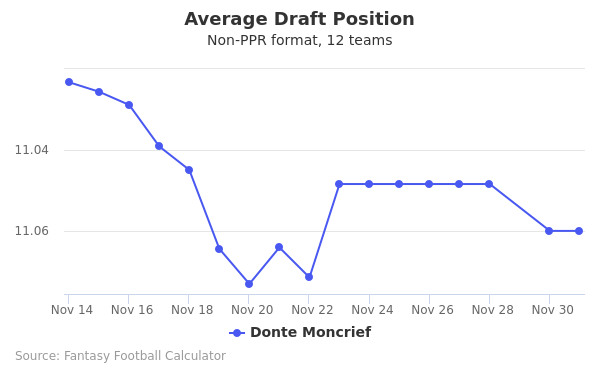 The code below will display a graph that updates every day to show the ADP data for Donte Moncrief for the past 30 days in 12-team PPR leagues. Draft Dallas Defense or Donte Moncrief? Draft Donte Moncrief or Kyle Rudolph? Draft Denver Defense or Donte Moncrief? Draft Donte Moncrief or Keke Coutee? Draft Austin Hooper or Donte Moncrief? Draft Donte Moncrief or Jamaal Williams? Draft Donte Moncrief or Wil Lutz? Draft Donte Moncrief or Malcolm Brown? Draft Austin Seferian-Jenkins or Donte Moncrief? Draft CJ Anderson or Donte Moncrief? Draft Donte Moncrief or Tre'Quan Smith? Draft Donte Moncrief or Greg Olsen? Draft Donte Moncrief or Kalen Ballage? Draft Adam Humphries or Donte Moncrief? Draft Donte Moncrief or Marquise Brown? 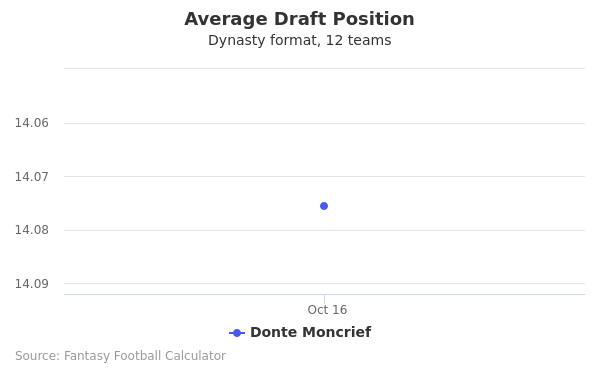 Draft Donte Moncrief or Ronald Jones II? Draft Donte Moncrief or Ted Ginn Jr? Draft Darrell Henderson or Donte Moncrief? Draft Donte Moncrief or Jordan Reed? Draft Donte Moncrief or New England Defense? Draft Chris Herndon IV or Donte Moncrief? Draft Donte Moncrief or Jack Doyle? Draft Donte Moncrief or Nelson Agholor? Draft Derek Carr or Donte Moncrief? Draft Donte Moncrief or Jalen Richard? Start Dallas Defense or Donte Moncrief? Start Donte Moncrief or Kyle Rudolph? Start Denver Defense or Donte Moncrief? Start Donte Moncrief or Keke Coutee? Start Austin Hooper or Donte Moncrief? Start Donte Moncrief or Jamaal Williams? Start Donte Moncrief or Wil Lutz? Start Donte Moncrief or Malcolm Brown? Start Austin Seferian-Jenkins or Donte Moncrief? Start CJ Anderson or Donte Moncrief? Start Donte Moncrief or Tre'Quan Smith? Start Donte Moncrief or Greg Olsen? Start Donte Moncrief or Kalen Ballage? Start Adam Humphries or Donte Moncrief? Start Donte Moncrief or Marquise Brown? Start Donte Moncrief or Ronald Jones II? Start Donte Moncrief or Ted Ginn Jr? Start Darrell Henderson or Donte Moncrief? Start Donte Moncrief or Jordan Reed? Start Donte Moncrief or New England Defense? Start Chris Herndon IV or Donte Moncrief? Start Donte Moncrief or Jack Doyle? Start Donte Moncrief or Nelson Agholor? Start Derek Carr or Donte Moncrief? Start Donte Moncrief or Jalen Richard? Donte Moncrief is currently a receiver for Indiana Colts, a player who had a very successful career in high school. In his senior year, he had 21 catches, 441 yards, and nine touchdowns. Interestingly, he also played quarterback at times, throwing for 365 yards and two touchdowns. His rushing stats were solid as well, as he ran 12 times for 144 yards and also returned two touchdown punts. On the defensive side, he registered 48 tackles and four interceptions that year alone. A dual-sport athlete in his native Raleigh, Mississippi, he was a two-time state champion in long jump. When being recruited, he was considered the 17th best receiver in the nation. Moncrief played for the University of Mississippi for three years. His freshman year saw him catch 31 passes for 454 yards and four touchdowns. He averaged 14.6 yards per reception. In his sophomore year, he caught 66 passes for 979 yards and 10 touchdowns while averaging 14.8 yards. In his final year, he caught 59 passes, picked up 938 yards, and scored six touchdowns. Confident of his skills and his draftability, he skipped his senior year to go pro. View college highlights. Moncrief entered the NFL Draft as a very respected and desired receiver. His combine skills were quite strong: his 40 time was 4.34, his 20 time 2.51, his 10 time 1.54, his vertical was 11'0”, while he benched 39 and one-half times. This, combined with his career in college, made him an intriguing player for many. That said, he actually went fairly late in the draft: receivers were at a premium that year and it wasn't until the third round when the Colts picked him. On May 30, he signed a four-year rookie contract for $2,808,520 with a $543,520 signing bonus, $543,520 guaranteed, and an annual salary of $702,130. Moncrief played his first game as wide receiver for the Colts in 2014. He played all 16 games, starting just two. In 49 target attempts, he caught 32 passes for a reception percentage of about 65.3 percent. He picked up a solid 444 yards for an average of 13.9 yards per catch. His longest was a 79-yard catch, his longest to date. Three touchdowns added to his usefulness, as did his four rushing attempts for 17 yards. In 2015, he again played in all 16 games and started in 10. He was targeted more frequently as a result, getting thrown to 105 times by Luck. Of those passes, he caught 64 for a percentage of 61 percent. He averaged 11.5 yards per catch, many of which were "after-the-catch" yards gained due to his speed. He scored six touchdowns. In his most recent season, he played nine games and started in seven. He made good use of his limited time, earning a completion percentage of 53.6 while picking up 307 yards on 30 catches. In one area he improved by scoring seven touchdowns. Consistency and reliability remain his strongest suits as he looks to build on his career in the future. View NFL highlights.